At 9:43 am, 330 men in three companies moved out. Companies C and D advanced abreast, while Company A was behind to protect the rear. The weather was clear and warm. The advance was slow through the thick, tangled foliage of scrub brush, bamboo and tall trees. Unknown to the Americans, the enemy had been preparing the site for several months, constructing camouflaged bunkers interconnected with trenches and tunnels and storing extensive quantities of supplies. At 10:30 am, with the first troopers a few hundred meters from the crest of the hill, a well-concealed NVA force opened fire with recoilless rifles, automatic weapons, small arms, rockets and hand grenades. Fr. Watters moved to the line of contact. When a wounded trooper was standing in shock in front of the assaulting forces, Father raced forward, picked the man up and carried him to safety. Soon after, he ran through intense enemy fire to aid a fallen soldier. The chaplain moved wherever he was needed. The NVA were now striking from all sides in a well-coordinated attack. The paratroopers were firing intensively, but the NVA continued to come. When the American defensive zone was forced to contract, Fr. Watters saw several wounded men lying outside of it. Ignoring attempts to restrain him, he left the perimeter three times in the face of automatic weapons and mortar fire to carry and assist injured troopers to safety. Then he moved about, aiding the medics, distributing food and water, speaking words of encouragement, and giving last rites to the dying. Charles Joseph Watters was born in Jersey City, NJ, on January 17, 1927. After attending Seton Hall University, he went to Immaculate Conception Seminary, and was ordained a priest in 1953. While serving in several parishes in New Jersey, he earned a commercial pilot’s license, and then in 1962 joined the Air Force National Guard. 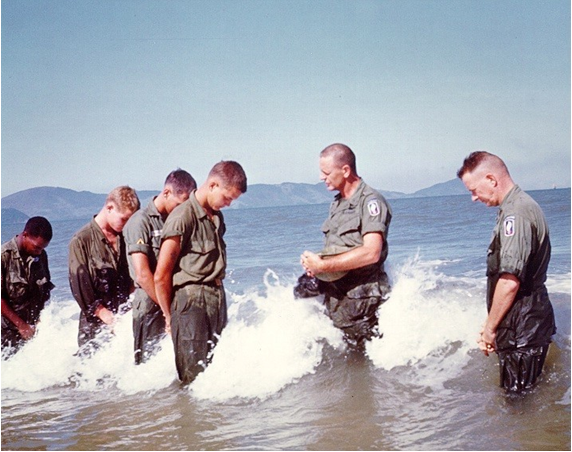 Three years later, Father enlisted in the Army as a chaplain, successfully completed airborne training and was assigned to the 173rd Airborne Brigade, nicknamed the Sky Soldiers. In June 1966, Fr. Watters, now a major, began a twelve-month tour of duty in Vietnam. He believed his place was with the fighting men, and so when a unit he was attached to rotated to the rear, he would join another unit in combat. He was constantly in motion, saying Mass, tending the wounded, joking with the men, giving spiritual guidance. In February 1967, he took part in Operation Junction City, which included the only combat jump of the Vietnam War. This helped endear him to the men, who knew he would risk his life with them. During this tour of duty, he was awarded an Air Medal and a Bronze Star with a V for valor. When his tour ended, he extended for another six months. After the friendly-fire incident in which Fr. Watters was killed, the Americans took Hill 875, and significantly crippled the fighting effectiveness of the North Vietnam units they fought. Fr. 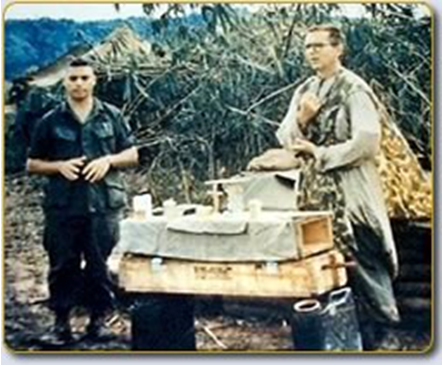 Watters was posthumously awarded the Medal of Honor, and has had schools, a bridge, a Knights of Columbus council, and the Army Chaplain’s School named after him.